We’re honored to have been named a Best Place to Work in Atlanta. 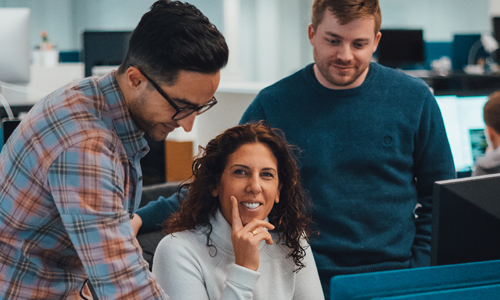 If you’re ready to work in a collaborative environment with colleagues who are lifelong learners and passionate about innovating, check out our job openings below. Together, we are changing the way people make data-driven decisions every day. You’ll be working alongside experienced entrepreneurs as we leverage the latest technologies to change how companies use big data. We are breaking away from tired, traditional software and are committed to delivering high quality, well-engineered solutions that fit into modern enterprises. As we grow, we want to help you grow as well, both personally and professionally. At AnswerRocket, you’ll be challenged in your career and have the ability to take on new responsibilities alongside an approachable, experienced leadership team. Whether it’s adjusting schedules to meet personal demands or taking time off to travel, we value work-life balance and flexibility. On day one, every Rocketeer has access to PTO, which includes three weeks paid time-off plus all standard holidays. Work in a cool, collaborative office space with health benefits and competitive pay. Plus, you’ll work alongside a talented, dedicated team of Rocketeers. Did we mention monthly catered lunches and bottomless snacks and coffee?